Infinite Roofing and Construction are GAF, IKO, CertainTeed and James Hardie certified. Protected Yard Installation Policy Preventing Common Damages from Roof Removal. Full Clean-Up: All construction materials and debris cleaned away after every job, as if we were never there. The now modern-day town of Clifton Park was developed back in the 1600s by the Dutch settlers. The town started blooming in the 1800s when the Erie canal opened, increasing accessibility to the region from the outside world and dramatically boosted local commerce. Clifton Park was mostly an agricultural town until the mid-20th century when early industries started developing. If you are looking to find some historic landmarks, the two places that really stand out with their history is Amity Church and the Grooms Tavern. Amity Church was founded in 1802 and is still one of the oldest structures in Clifton Park that stands strong. As the years have gone by, the town has progressed and made its name very well known in the capital region of New York. As a tourist, when visiting Clifton park one of the key places to stop and explore would be the Clifton Park Center, which features 72 different stores and a food court, so you can shop and eat on the go. If you are looking to do something with the entire family, Ellms Family Farm is great to enjoy family traditions like pumpkin picking or exploring a corn maze. This amazing fun filled family farm is just in the vicinity of Clifton Park. While on that Clifton Park exploration, another unique spot that you may consider going to would be the Congress Park. Again just outside of the town it is an amazing place to stop by to take in the capital region history with your own eyes. Every family and individual out there is looking for a safe place sturdy place to live in, but like other things, the sturdiness of a structure fades away over time too. This is when our experienced Clifton Park roofing contractors will play their part. There are only some issues when it comes to roof repair that can be taken care of yourself as a DIY project. Roof replacement and roof repairs can be dangerous to fix, so doing it yourself isn't something that is recommended. If you come across any roofing issues, they would be best dealt with by enlisting the help of a professional roofing contractor. Your home is your biggest, possibly most important investment and the roof is one of its vital parts of its infrastructure. When you realize how important the integrity of your roof is, it really is best to hire a Clifton Park roofing company to work on it. Rest assured that with Infinite Roofing & Construction, the best roof repair services ensure the strength of your roof for years to come. Infinite Roofing and Construction has been serving Clifton Park homeowners and businesses for all their roofing and siding needs for over 20 years. 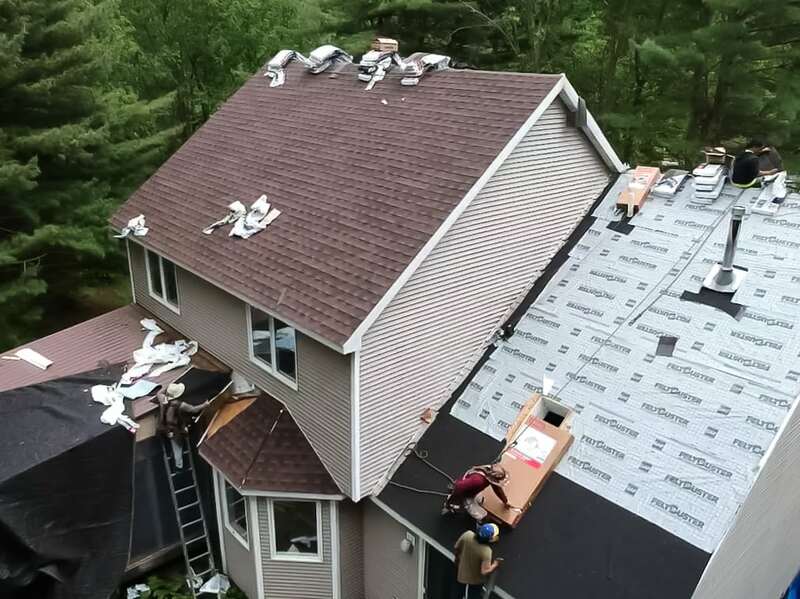 Any Clifton Park roofing contractor would understand how stressful it can be to have your house damaged by a freak storm and then have to repair it. We can make your search easier by offering you the best advice and services available for any roofing issue. For any residential and commercial roofing issues, Infinite Roofing is here to help. Did you do a quick inspection yourself or have you found that your roof is leaking? It’s time to hire the best Clifton Park roofing experts to handle the roof repairs for you. A roof replacement could make a huge impact on your finances, and if that is the case, roof repair should be the option you should look at. Roof repairs can be tricky, so it is important to hire the most experienced and professional roofing contractors that would solve your problems and deal with it in the very best way possible. The best way to look after your roof is through regular maintenance and routine inspections. Then you can learn as soon as possible if anything needs fixing, before it’s too late. It’s the kind of work Infinite Roofing can take out of your hands, giving you that extra peace of mind. Whether it is inspections, maintenance, roof repair or replacement, our expert Clifton Park roofing contractors are here to help. For when you've got a roof leak problem and you need it fixed - and for the roofing problem to stay fixed. Includes service for smaller repairs all the way up to partial roof replacements. Have a roof over 20 years old or severely damaged? We'll replace the whole thing as certified GAF, IKO and Owens Corning roofers. Most shingle roofs are done in one day. Flat roofs require a slightly different approach than other types of roofing and we specialize in EPDM, TPO and other styles unique style flat roofs for both commercial and residential work. Clifton Park is a town that was developed back in the 1600s. Even though it was just an agricultural town until the mid 20th century, the Erie canal opening in the 1800s gave access to busy water trade routes and made it the perfect town to develop commercial industries and make it a thriving commercial hub. There are a lot of renovated and new buildings that have been developed throughout the years, and maintaining the infrastructure of these properties is important. Considering the residential and commercial boost to the town, you can see a great variety of different types of roofs in Clifton Park. The capital region can experience of a lot of harsh weather. With the changing seasons comes the heat waves, snow storms, rain and wind. These constant natural elements can cause havoc to our roofs and they are the main part of the house that suffers. Capital region roofs do not have easy lives. In Clifton Park there are tons of flat roofs on commercial buildings and, even on residential buildings, but then there are also your classic shingle roofs throughout most of the residential part of town. 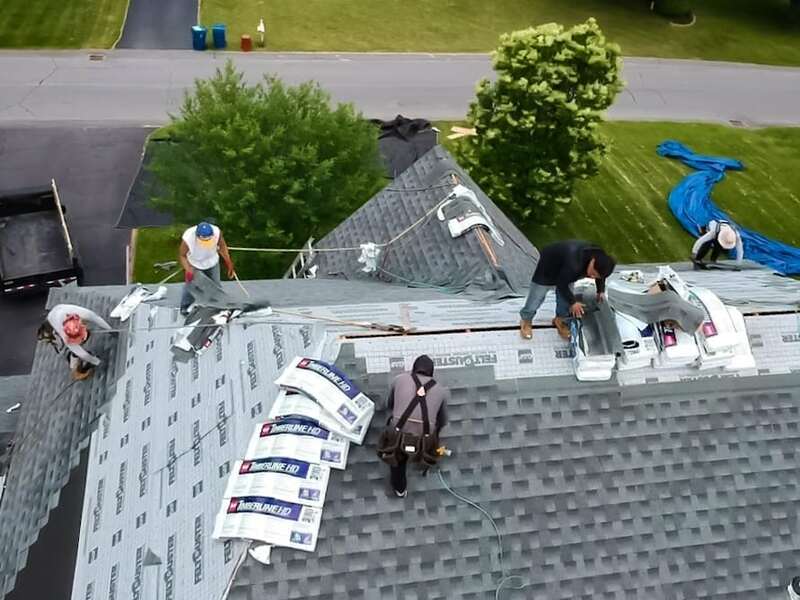 So when trying to find Clifton Park roofing contractors for your roof replacement or roof repair on your home or business, you're going to want to hire roofing contractors who have experience dealing with the unique construction styles and challenges unique to the area. 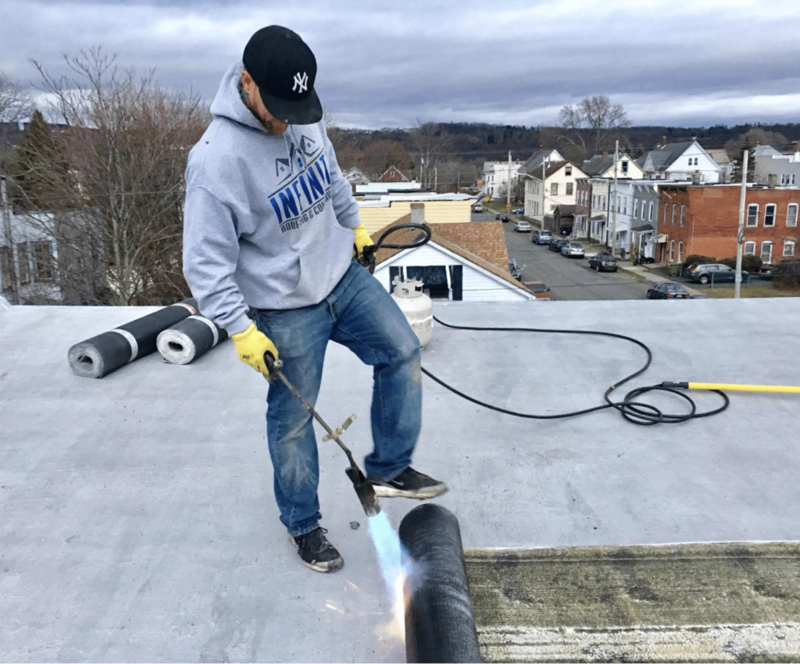 Infinite Roofing has been installing residential and commercial roofing in Clifton Park for years, so if you are looking to have any roof replacement or repairs done, Infinite Roofing is your go-to commercial roofing contractor. Do you want to explore our financing options for your Clifton Park roof? In a lot of cases with roof damage, the expense isn't exactly planned. It can happen out of nowhere and sometimes insurance, State and local grants and loan programs cannot help. That's why we've maintained an excellent relationship with key vendors and financing agents, in order to get you access to the funding you need if other options are unavailable to you. 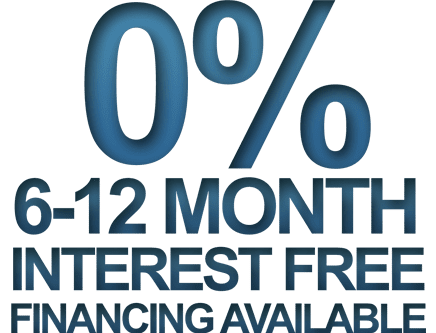 These types of financing for your roof don't require you to put up your family home as equity, and there are options for zero interest, the same as cash financing over 12 months (choose Foundation Finance for this option) - plus, they will guarantee approval. One Main Financial offers a lower interest rate and is best for average and above credit scores. With both options both companies will finance either the full cost of the project (e.g. roof only, roof and gutters, roof and siding) or just a part of the cost. You'll get exactly the level of commitment you need for your project to come get off the ground. If your roof has been damaged by one of the many recent storms we've had around Clifton Park, we encourage you to start the Insurance claim process first. Insurance may pay for most or all of the roof depending on the circumstance. If you need help, please feel free to give us a call! Get new Seamless Gutters from our certified Clifton Park Contractors. The gutters play a very important role in the functionality of your roof. They provide a path and act like a highway for all the water to go down the spout and away from your home. Gutters need to be inspected by professional roofing contractors to make sure there is no debris clogging them up. If there is, that can create a serious problem. You want to avoid any of these issues by maintaining the gutters and adding extra safety measures to protect yourself from any mishaps happening in the future. If your house is surrounded by many trees and you are worried about leaves clogging up the your gutters, consider getting gutter guards. These grates or cages are installed over the top of your gutters to keep leaves and other large debris from collecting, and the water keeps flowing freely underneath the guards. With gutter guards, most of the debris will fall on top of the guards and eventually blow off with the wind, anything remaining can be taken care of easily with a broom. They are also extremely easy to install and you can do that yourself, but consider having a roofing contractor in Clifton Park install the gutters the right way so they can be at the very top of their functionality. Having roofing contractors come out to your residential or commercial property is easier than ever when you use the fast and easy to reach service at Infinite Roofing. Our top rated service is second to none in the region. We take pride in our work and our customer care. Booking a free estimate is completely painless through our website and you can call anytime to build a free estimate at the best Clifton Park roofing company at 518-444-ROOF. We can help you with anything from roof repair, to an entire roof replacement. Our most experienced roofing contractors will inspect and determine the problem for you, then give you the best estimate that would be affordable to you. Our full coverage warranty will also help in the future. With 10-year coverage on labor and materials, you can stay safe and sound in your house and not have to worry about the roof over your head.